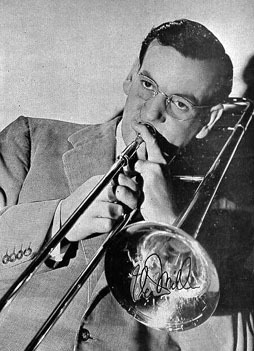 Glenn Miller began his career as a professional musician after dropping out of the University of Colorado in 1924, having already worked in a number of orchestras throughout his school years. Eventually he moved to Los Angeles to play in the Ben Pollack Orchestra, which also featured future Big Band luminaries such as Benny Goodman and the Dorsey Brothers. It was during this period that Miller was first given the opportunity to create his own arrangements. When the Pollack Orchestra moved to New York in 1928 Glenn Miller moved with it, but left the band shortly afterward and worked for many years as a freelance player and arranger. By this time his reputation in Big Band circles had reached considerable proportions, but while he was able to successfully establish orchestras for other musicians (Smith Ballew, The Dorsey Brothers, Ray Noble), his first few attempts at setting up a group under his own name failed to get off the ground. In 1938 the right combination of elements was hit upon at last, and The Glenn Miller Orchestra quickly surpassed the popularity of every other orchestra, breaking one attendance record after the other at major venues around the East Coast. Miller also became the first artist to be recognized for selling a million copies of a record with the single Chattanooga Choo Choo, which was featured in his band's first motion picture appearance, Sun Valley Serenade. After being inducted into the Army in 1942, Miller established the Glenn Miller Army Air Force Band. The band made hundreds of appearances and broadcasts to entertain the troops, both in the States and overseas. In December of 1944, while flying to Paris to make arrangements for an upcoming performance, the plane carrying Glenn Miller vanished without a trace. A motion picture based upon his life, The Glenn Miller Story, was released by Universal in 1954 and featured the actor Jimmy Stewart in the title role.